Publisher: World Scientific Publishing Europe Ltd.
Nute incorporates science, literature, philosophy, and art to make his case, which creates a pleasurable and interesting read throughout. Reading about the precise way that light reflects through surfaces and what that means for inhabitants makes one acutely aware of their present surroundings. As I read about light refracting through glazing, my eyes couldn’t help but linger at the light reflected from the window behind me as it cast shapes on my fingers and on the opposite wall. This is because Nute’s subject, as he emphasizes, is not tied to the past or the future. The effect of sun, wind, and rain are all uniquely present experiences. Upon reading, almost reflexively, one begins to examine and question the buildings around them—to what extent do they isolate us from the elements of the earth and how much do they harmonize with them? Naturally Animated Architecture has a tightly crafted argument. Nute begins by convincing the reader, quite effectively and rather poetically, of “two key resources that are essential to our long-term well-being: nature and perceptible change.” This is because, he explains, that for most of our history, human beings have been outdoor creatures, and our physiology reflects that. We feel best not in towers that hold at bay any evidence of the outside world, but in spaces in which we may witness it. Nute’s goal is to show us the ways in which architecture can achieve this. Early on, he eliminates the idea of simply using windows, or photographs, or paintings of the outside world to solve this problem. They “can often seem remote,” and it is a certain uncontrolled element that real, changing movements of weather have which make them appear more authentic. Thus, he is showing us how to bring “weather-generated movement indoors.” These movements are divided into three parts, which also divides the book: sun, wind, and rain. Each section begins with something of a history of how the element was used in architecture and then continues on to practical ways in which the element could be integrated. Each chapter also explains how the design to integrate its element is compatible with energy-saving goals. Naturally Animated Architecture begins with the sun, which can transform spaces due to the way the light changes over the course of a day. Nute is looking to make this phenomenon more personal and obvious in buildings. Thus, he examines ways in which projected sunlight can be used in design. He poses the idea, for example, of ensuring that the surface that the light projects on is vertical, which creates a highly visible, large moving shadow. Another way to create a visible shadow, he explains, is to vary the thickness of the glass it is projecting through. He also explores the patterns of light that can be made, introducing the idea of shading the sunlight, the ideal surfaces for sunlight, and the possibility of coloring sunlight. He points out that because of changing weather and the earth’s changing position in relation to the sun, no use of sunlight will ever look exactly like the day before. The second element in Naturally Animated Architecture is wind. This is heavily tied to foliage, as wind is something one can feel the effects of and watch the effects of, and yet we cannot actually see wind. Nute points to the effectiveness of internal courtyards that have trees or plants in them, with a roof opening to the exterior world. Thus one can watch the wind at work, while the building still protects from the effects of it. Nute, who is interested in the idea that buildings can be environmentally friendly and also connected to the environment aesthetically, points out that these courtyards can be used to ventilate buildings when empty. Furthermore, combining his idea of creating shadows using sunlight from the previous chapter, Nute suggests the idea of shadows cast by foliage, animated by the wind. He points out that while such movements can be artificially generated through projected or fake foliage, his studies show that generated motion “was considered significantly less natural and more distracting than the movements of real foliage.” This, he finds, also holds true of screen patterns. While mesh screens are also an effective way of displaying movement through shadow, not all shadows are the same, and the more obviously mechanical a pattern is, like moving moiré patterns, the more distracting it will be. Ultimately, Nute points out, creating shadows out of naturally occurring forms in nature are ideal. One way to do this is to use the shadows cast by moving air on water, which creates varied patterns. Ways to do this include creating internal courtyard pools or installing roof pools, among others. Continuing with the discussion of the second element, wind, Naturally Animated Architecture points to the idea of using the pinhole effect to “introduce live images of the outdoors into buildings.” This section is the only odd part of the book’s entire narrative, given that much of the argument is about sensory integration of internal and external rather than the remote alternative: windows and paintings. Projections of outside scenes indoors seem like something of a combination of the window and the painting, and are, in some ways, alien to Nute’s thesis. Furthermore, he does not extrapolate on whether or not studies show whether this method is effective, or remote and alienating, whereas most of his other examples are backed by such research. The final element in Naturally Animated Architecture is rain. Nute moves from ancient impluviums to its natural modern extension: internal courtyards. Here, the architect has options: allow the rain to be seen but not heard, or to be heard but not seen. Other ways to incorporate rain include rainwater runoffs and transparent pitched roofs. Furthermore, Nute, who seems a big fan of the use of shading, comes back to rain shadows on indoor surfaces. After discussing all three elements, Naturally Animated Architecture moves on to some other topics. It is not immediately clear why these sections come after, or why they could not be integrated into the previous three chapters, but they offer interesting insights. Nute discusses the ways in which his methods are connected to sustainable building practices. He shows us an interesting dichotomy: some weather animated practices are simply compatible with sustainable design, while others “actively reveal” those designs. It is not immediately clear why the latter is more desirable, but Nute seems to imply that it is. He then goes on to discuss the appeal of nature over technology in creating movements, a topic that also comes up earlier in the text. Afterwards, he moves onto the topic of water-light shelves and discusses studies he was involved in that measure the degree to which the reflections of water were distracted. The following sections also discuss more in-depth studies that Nute prepared in order to understand what types of animated movements people found pleasing or beneficial, and which were ineffective. These studies add depth to an already persuasive argument. 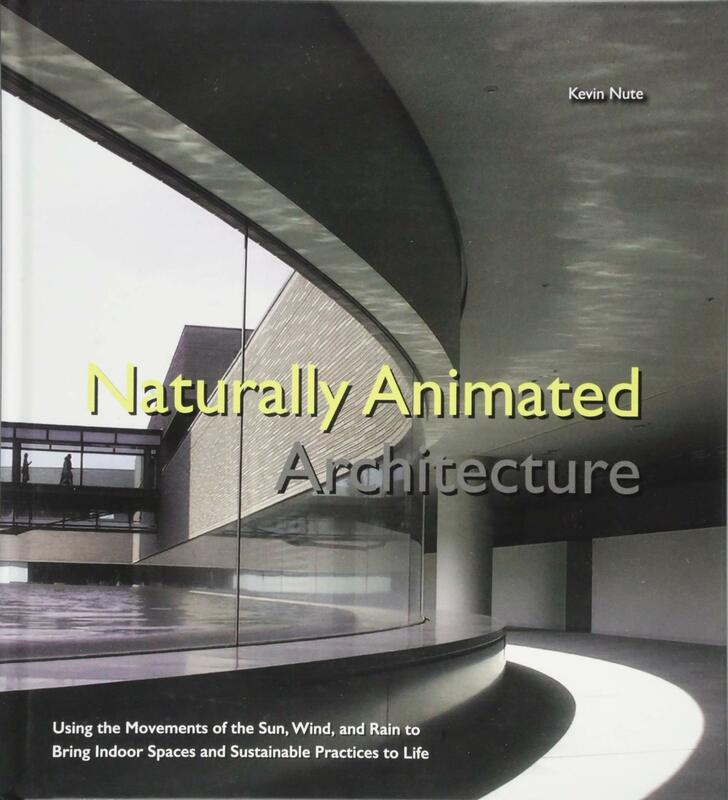 Naturally Animated Architecture is good at demonstrating what it argues with studies, and with pictures and videos. In fact, one can download an app prior to reading the book and using it to watch the corresponding videos as indicated in the text. This is extremely helpful, as much of what Nute is discussing involves witnessing movement. Ultimately, Naturally Animated Architecture poses interesting questions about the varied roles a building must play, and the ability of an architect to integrate, rather than alienate, the occupants for whom it is being designed. Nearly philosophical at times, Naturally Animated Architecture is an important book for the future of design, and one can already see some of its suggestions in recent landmark buildings, such as Apple’s new Cupertino headquarters. Sarisha Kurup is a contributing writer at AECbytes. She is interested in art, architecture, and history, and in understanding the impact of technology on architecture.